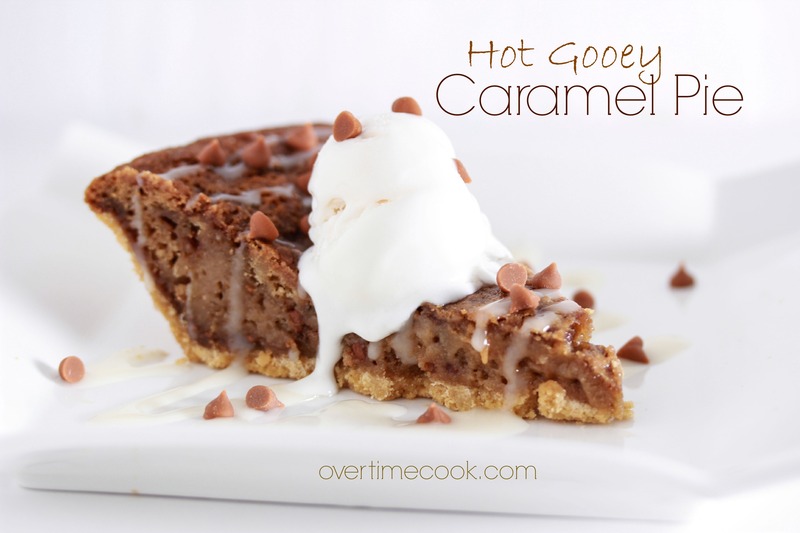 Hot Gooey Caramel Pie is as delicious as it sounds, with very little prep time! So it started one night when I was going to take a brownie mix I had in the pantry and bake it into a graham cracker pie crust. But then I couldn’t find the brownie mix I thought I had. So plan B was a cheesecake baked in a graham cracker crust. But then plan C formed in my head. What if I baked blondies into a graham cracker crust? Then my 4th and final plan formed. What if I kinda combined plan B and plan C? So I pulled out the mixer and made the first batch of this. I didn’t even know what to expect out of this, it was simply a late night whim. I didn’t even measure! But then it was awesome. And everyone raved about it. So I had to try to recreate it. Luckily, it turned out as well as it did the first time! My bigger challenge, it turned out, was naming it. I described the dessert as what happens when cheesecake and chocolate chip cookies get together and have delicious little babies. But that’s a very long name for a recipe. Take a look at this picture though, and you’ll understand why I came up with the name I did. Hot. Gooey. Caramel. Pie. And yes, it is as good as it looks. But no, it isn’t hard to make at all. In the bowl of an electric mixer, over a medium speed, cream together margarine and Tofutti cream cheese until smooth. Add brown sugar and corn syrup, and beat until smooth and creamy. Add eggs, baking soda, and vanilla, beating to combine after each addition. Turn the mixer to low, and add flour. Beat until combined. Stir in the caramel chips. Divide batter between the two pie crusts. Bake for 30 to 35 minutes, until the center is just set (it will still be wiggly). Serve hot with ice cream and caramel sauce (optional). Note: this dessert is best served hot, with ice cream, but it is also delicious cold, with or without ice cream. Cold gooey caramel pie. It’s awesome either way. Oh my god that is such a gooey delicious looking pie. I am drooling while typing this comment. Where can you find caramel chips? Are they dairy or parve? They should be available in any kosher grocery store – in parve. You can sub butterscotch chips if you can’t find any. Whoa mama!! This sounds fabulous!! This looks and sounds amazing!!! is there a corn syrup substitute? hi miriam – this looks amazing and my sister and i are iy”H making it for sukkos! Just one q: if we freeze it and want to serve it warm, how do we rewarm it? details, please. TIA! Looking forward to making this on Succos! I was searching for a new dessert recipe that’s easy but yummy. This looks perfect! I’m glad that you were able to re-create the recipe and share the ingredients because this is a pie that definitely should be shared. I made it today, but it came out light and fluffy. What did I do wrong? My guess is you baked it too long. how do i rewarm this on yom tov? Oven or hot plate should work. oh my they look so delicious i want a bite! The pie looks great. How can it be made ahead and either baked at the last minute or warmed up right before serving? Oh my gosh this looks delicious, can’t wait to give this a try! Is this graham cracker crust or pie crust? My kind of pie! I cant wait to try this one. Not sure if I’ve ever seen caramel chips before, so now I’m going to hunt them down. You think I can rewarm it on a hot plate? oh my good lord that looks BEYOND amazing. honestly out of this world! Any substitution for corn syrup? Don’t like baking with it…..thanks….looks so yummy! Need to make this even thow yom tov is over, it sounds amazing, pls post a vegtable next because I’ll need a diet after this can I make it milchig with butter and cream cheese? This is incredible! Can’t wait to try more of your recipes! 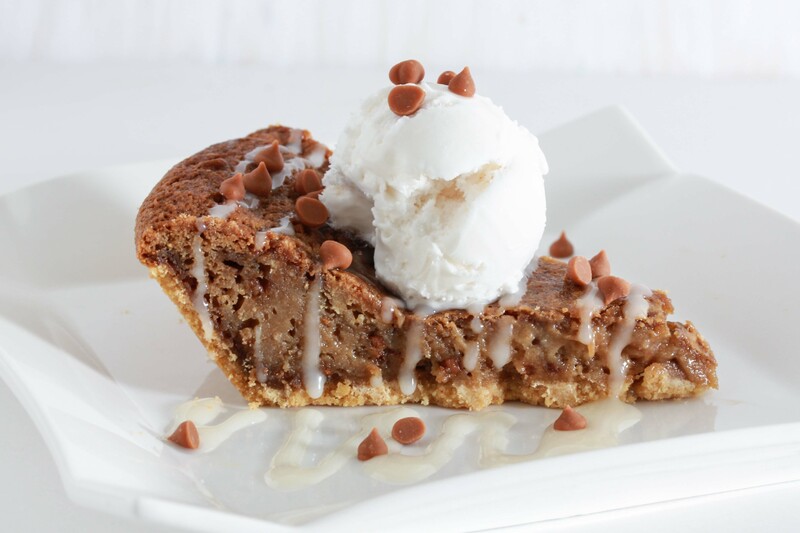 How would u freeze this?…..the whole pie or can I slice it first…or will it be too gooey? i really want to make this. I cant find caramel chips. Can i use caramel cream instead? Rather use butterscotch chips. The cream will mess up the texture. Do u think I can make this in mini grham cracker pie crusts and for how long? Hi I wanted to make this recipe for 1 pie crust. Is it possible to split the recipe? I don’t own a mixer can I do this by hand? if you use mini choc chips would it be like a runny choc chip pie?? can you use reg choc chips instead of the caramel ones??? Can u substitute anything else for the margarine? Thx! I haven’t tried it with oil – I don’t know if it will have the same amazing texture. Does using dark or light corn syrup make a difference? Either one will work here. Which one do you personally use? Hi, this looks delicious! What kind of brown sugar do you prefer? Thank you! You can find those instructions in my cookbook! I don’t have enough caramel chips. Would it work with peanut butter chips? Or reg chocolate chips? Thanks! Both of those would change the flavor a lot. You’re better off using less caramel chips. If I split the recipe in half to make one pie, can I leave out the corn syrup? The corn syrup is vital to the texture. If you half the recipe, you should half the amount. what I use instead of cream cheese and tofutti cheese which I cannot find in the stores? How long do I bake it for in mini pie crusts?